Infliximab is a chimeric human-murine monoclonal antibody directed against tumour necrosis factor alpha (TNFα), manufactured from a recombinant Sp2/0 cell line. Infliximab contains approximately 30% murine variable region amino acid sequence, which confers antigen-binding specificity to human TNFα. The remaining 70% correspond to a human IgG1 heavy chain constant region and a human kappa light chain constant region. The product contains 10 µg recombinant Infliximab isotopically labeled (stable isotopes - non-radioactive) produced in CHO for in vitro research purpose and intended to be used as quantification standard in mass spectrometry analyses.This product is for research use only and is not intended for diagnostic or therapeutic use. 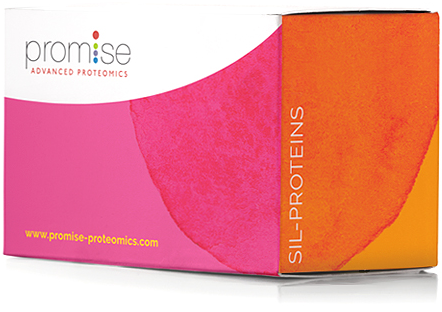 PROMISE Advanced Proteomics shall not be held responsible for any damages resulting from the use of this product.